Very nice, heavy duty. Might need to purchase another one. Dress up your windows with this elegant curtain panel. Crafted with plush velvet fabric and a blackout lining, the curtain blocks out harsh light and harmful UV rays, and the thick fabric helps to insulate your home to lower utility costs. The simple, flowing design and rich black color complement any decor with understated sophistication. These drapes are a great find and very high quality! I make custom drapes and didn't have time to make any due to moving and the Christmas season, so I took a chance and ordered these and am so glad I did. I could not have made these drapes for this price. Very wide, full, and complete blackout. You don't even have to iron them. They have a tape on the back that can be used to put hooks, or clips in, or you can just run the rod through the header. Buy these and you won't be disappointed. Bought 2 of the 100 inch black and 2 of the 50 inch black for same room. The only slight neg. was that the 100 inch has a pure white lining while the 50 inch panels have an ecru lining. Other than that, they match perfectly, and hang beautifully on clip hooks with rings. Very elegant and look like they would cost a lot more than I paid. Couldn't be happier. Wish they came in more colors. I would purchase more. i removed the lining so it's not as heavy. the black fabric is still black-out. i needed to make them longer and found out the fabric doesn't unravel at all...kinda like moleskin or ultrasuede. i used the hooks included plus extras so i can draw it all to one side-about 12" when pushed together (without lining). i added black fringe to the added hem length which made them about 7 inches longer for our stage. i would never be able to find fabric 100" wide to make them completely by myself. they're very nice and drape well. These are Amazing! I had just talked to a custom curtain designer and after hearing the $1200 price tag on the velvet curtains, decided that I would have to settle for something similar, but more budget friendly. I came home and looked on Overstock and found these. They seemed to fit the bill, but I wondered what the quality would be. My mother was at my home the day that they arrived. A little background, my mother is a fabulous seamstress and decorator. She could not get over how well these curtains were made, the quality of the materials and the little extras like the row of trim at the top to attach the rod clips to. They are every bit as exquisite as the $1200 curtains that I had priced. I am so happy that I looked at Overstock. I got exactly what I wanted without breaking the bank! I was given quotes of $1100+ for custom made blackout, velvet curtains. You can't even buy the material for the price I got these at. They really look beautiful on my extra large window. I LOVE THESE CURTAINS !! I have had them for about 5 years now in a full windowed room. The color has held up beautifully. They hang beautifully. They are thick, heavy, plush and velvety soft. Excellent for watching movies. They are complete black out curtain's. I highly recommend them. 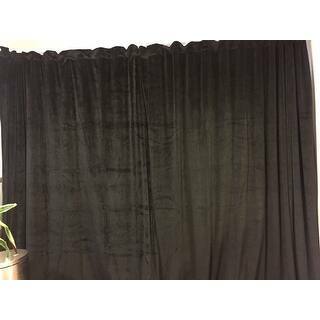 If you want black velvet drapes, buy these! I really wanted the off-white version of these drapes, but once I decided to order, they were no longer available. Based on the excellent reviews, I changed up and ordered in black. I really love these drapes. They provide excellent thermal and light protection, and hang beautifully. I hung these with eyelet rings that I also purchased from Overstock. Finding *any* drapes long enough and wide enough for my space was a challenge, and to find them at a great price was a bonus! Bought these for our home "studio" to cover the french doors when we wanted all light blocked out. Price was great for extra tall, extra wide, blackout curtains. Look and feel are perfect! Only wish the sewed in openings for a curtain bar were wider, but we did use a really thick rod due to the weight and length of the area as well as it all being "mighty". These curtains are absolutely beautiful! They’re exactly what I was looking for and the wide panel at 100” wide is prefect for the large window I have in the living room! Great quality and complete blackout. Very heavy and lined well. Happy with purchase. great quality, true to the reviews. recommended,great for my minimal look I was going for. Even after 5 years these are still great. This was my second purchase of this item. I bought 2 panels and ended up needing a third. These are thick, full length and nicely backed in a white backing material. They may not be technically ‘black out’ drapes but they sure do the job, allowing me to watch my projector in the living room during the day. 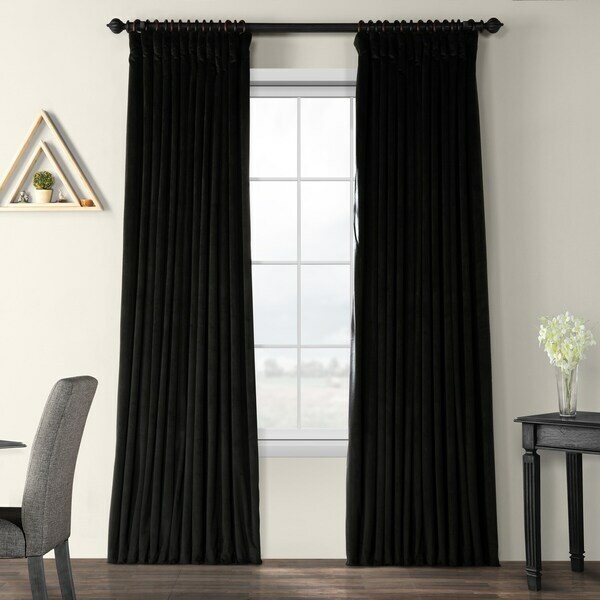 After some bad luck trying to find black out curtains that where relatively inexpensive but good quality, we ordered this set and where pleasantly surprised by the material, quality and ability to block out light. We love them! Very happy with this purchase. Love the feel of the velvet. The black is a true black with no gray tones and no light gets through. A heavy drape. Very nice curtains. Purchased in black, true to color (not purplish). Very thick and plush but able to hang using curtain rings. We don't use it to blockout the sun, but it would definitely do the job. Really like how heavy and well made they are. Disliked that the lining is white because sometimes you can see it and it's a hard contrast. Would buy again though. Love Curtains very much. They originally got lost in shipping but somehow ended up on my door step two weeks later. True Black, thick, and block every bit of sunlight. Very Happy with my purchase . Worth every penny! Those curtains are fabulous! The best blackout I have ever owned, it completely blocks light from outside, the fabric is high quality velvet, the curtains were super match for my black and white bedroom. Couldn't be happier! Fabulous curtains! They look rich and luxurious and they hang beautifully.Also, it may be helpful to know they DO block out the light completely. Love it ! Curtains are heavy and thick and go nicely in my master bedroom. I love the extra volume created by the 100 foot wide span. Very satisfied and would purchase again. "Do I need to order 2 panel i have two window"
For two windows you will need 4 panels. "Wondering if these are solid colors on both sides? I'm trying to find blackout theater curtains for a doorway and do not want to see white on one side of the panel. Thank you!" The backside of this panel shows the blackout lining which is a cool beige color. "I want the panels to bunch on the floor as shown in picture but where my rod is placed, it measures almost right at 84". Any suggestions?" To create the look of puddling you would purchase a size longer than your measurement of the rod to the floor. "Hello, I wanted to know how wide these panels are? I can see the different length sizes, but not sure when it says "extra wide" what the measurement are. Thank you"
"how wide is the 100' panel when pushed together at the side? i need to know how much wall space i need on side when drape is open for full view out of the window." I put my 100 inch panel on 17 clip hooks. When pushed open it condenses down to about 16- 17 inches. "What is the diameter and length of the rod, and the rings pictured for this panel? Thanks for your support." You may enjoy item# 14768146, 14329720 and 15055167. "Does 1 order include a pair or just one curtain panel?" One panel but they are wide and amazing. Best purchase I've made. I bought clips so they glide easier and they come with drapery hooks.